A glance at the first detailed map of the New Forest, the late-18th century Richardson, King and Driver map, goes a long way to explain why Lyndhurst has for many years been considered the capital of the New Forest – relatively central location was important, and, maybe more so, was its position on a busy junction of roads. And although many 18th century roads were not much more than dusty tracks, the main through-routes operated by turnpike trusts were likely to have been considerably better. The turnpike trusts charged for the privilege of road usage, and in return maintained the roads, replacing the previously haphazard system of parish maintenance. Strategically placed toll gates were set up as payment collection points, usually on the edges of towns and villages through which the roads passed, and roadside milestones and mileposts were provided. This Trust’s route came into the village on what is now the A35, the current Southampton road (1); passed along the High Street to the main coaching inns, the Fox and Hounds (2) and the Crown (3); and left Lyndhurst along Shrubbs Hill Road (4), past Goose Green (5) and out on the A337 (6) towards Brockenhurst. The exact route did, though, seem to vary. Angels Farm House (A), a structure dating back to the 16th century, stands on the corner of Chapel Lane and Pinkney Lane. It is not shown by Richardson, King and Driver, but was recorded as Turnpike Gate House in 1838, suggesting that the turnpike route at that time passed this way. Richardson, King and Driver do, though, show a toll gate close to the main entrance to Foxlease, not far from Goose Green. The accompanying gate house (B), a thatched cottage, stood beside a narrow stream, and at least latterly, was very damp. It was demolished in the 1960s, although a garden on the site is still cultivated. It has been suggested that tolls were also collected in Chapel Lane, close to the property now known as Old Lodge (C) – this originally was a lodge to Foxlease House, and is next to a now disused entrance to Foxlease. This entrance, as some will have it, was specifically made to enable Foxlease travellers to avoid paying tolls at the original gate. A contemporary milestone can still be seen in Shrubbs Hill Road (D). The stone is a three-sided, solid block in which the distances to Lymington and Southampton are carved – 8 and 10 miles, respectively. Another stone, this of different style, squats beside the A35 Ashurst road (E), on the outskirts of the village, in somewhat ignominious company with a modern, Wilts and Dorset bus shelter. The stone is marked on the old map as ‘Nine miles from Lymington’. From 1753 to 1870, the Salisbury, Landford, Ower and Eling Turnpike Trust operated between Salisbury and Eling along today’s A36 through Ower; and also between Eling and Cadnam along the A336, with, in 1771, a branch road into Lyndhurst along the current A337 Cadnam road. 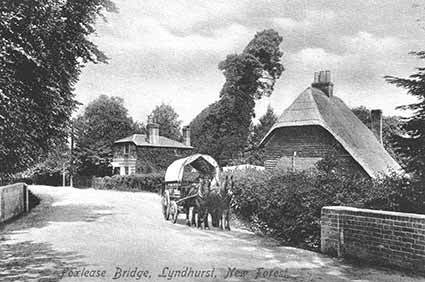 The Lyndhurst toll gate was originally 2 kilometres (1¼ miles) outside the village, not far from the turn for Minstead, but was eventually moved to the small black and white house, Turnpike Cottage (F), opposite Racecourse View on the outskirts of the village. But to ensure that travellers from Pikeshill had to pay the tolls, it was moved again, this time to the delightful thatched cottage (G) opposite the Penny Farthing Hotel. Pikeshill residents, though, in 1834 successfully petitioned the Trust, and the gate was moved back to Turnpike Cottage. A simple, two-sided milestone can still be found beside the A337 road leading towards Cadnam, close to where the original tollgate would have been. Badly worn, weather-beaten and ivy-clad, it is marked ‘Sarum 17, Romsey 9’. Why Sarum and Romsey is a bit of a puzzle. To reach these destinations, travellers perhaps connected at Cadnam with coaches of the Romsey and Ringwood Turnpike Trust, 1758, running on what is now the A31. And finally, in 1841, the Christchurch and Lyndhurst Turnpike Trust completed the link with Christchurch along today’s A35; although, seemingly at the request of Lyndhurst residents anxious to avoid making payments for travelling on the early part of the route, the nearest toll gate was placed at Brinton Toll Bar (7), the cottage now known as New Forest Gatehouse, near the Forestry Commission Reptile Centre 3.25 kilometres (2 miles) outside the village. Before this, a road or track known as Stony Lane went from Swan Green to what is now the nearby hamlet of Bank, whilst the Cut Walk was a popular route for travellers journeying further afield, south-west from Lyndhurst – link to the Cut Walk. The Christchurch and Lyndhurst Turnpike Trust’s nearest surviving milestone (8) is 6.4 kilometres (4 miles) from Lyndhurst, beside Burley Old Inclosure. Quite high up on a roadside bank, it is clearly visible in winter, but shrouded in vegetation at other times. In keeping with its later date, it is a small triangular stone to which on two faces metal plates were attached. Only one survives, which in the manner of the time reads 'XtCHURCH 10, BOURNE 15'. (In the early 19th century, the centre of Bournemouth was known as Bourne Mouth, after the name of the small stream that there joins the sea. Even by 1841, the population was only a few hundred souls. How times change)!